A refreshing parsley salad with bulgur, tomatoes, cucumbers and tomatoes dressed with a lemon vinaigrette. Tips for making the best tabouleh. It’s been a long cold winter and my body’s been aching to eat something vibrant and green. It’s still a bit early for spring vegetables, but Tabouleh is a verdant Levantine salad you can put together with vegetables and herbs that are available all year. 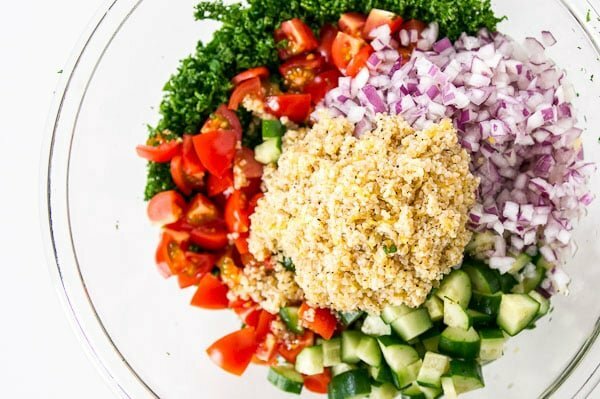 While it’s a simple salad to prepare with very few ingredients, here are a few key points that separate a great tabouleh from a bowl of rabbit food. First, as with all simple dishes, it’s crucial to use the very best ingredients. This means good quality olive oil and fresh parsley. But the two most important things are to use ripe tomatoes and tender cucumbers. Since it’s not exactly the height of tomato season right now, I used cherry tomatoes, which tend to be sweeter. As for the cucumbers, I like using Lebanese cucumbers for my Tabouleh because they have tender skin, a nice crunchy texture, and just a bit of sweetness, but japanese cucumbers also work well. If you can’t find either, use a hot house cucumber (a.k.a. English cucumber), removing the seeds with a spoon. The second thing is to soak the bulgur in the dressing. Many recipes tell you to cook the bulgur. Bulgur wheat is par boiled before it’s dried and so putting it in boiling water will make it too soft. Traditional Tabouleh recipes usually call to soak the bulgur in cold water, but I prefer soaking it in the dressing because it absorbs the concentrated flavors of the dressing, keeping the finished salad from tasting watery. Lastly, don’t be afraid of the parsley. 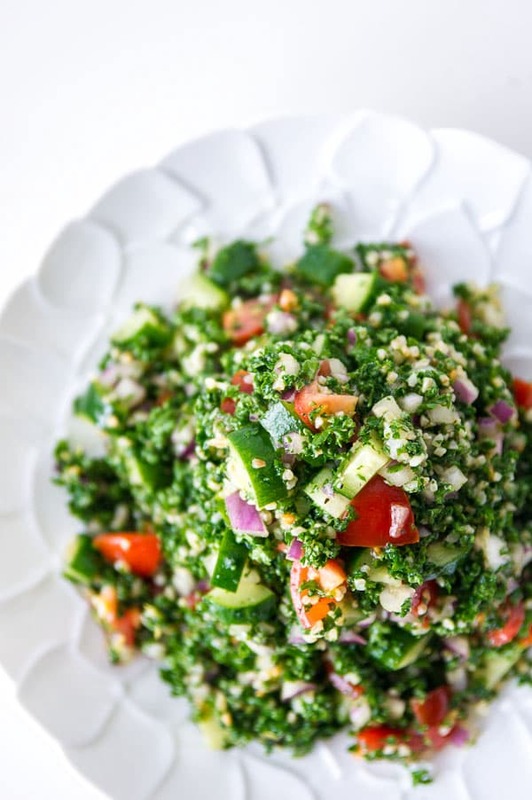 According to Wikipedia “The Levantine Arabic tabbūle is derived from the Arabic word tabil, meaning seasoning.” since bulgur isn’t much of a seasoning one can only imagine that the name is referring to the potent herbs that go into the salad. I know many people are used to thinking of parsley as an inedible garnish that comes with your meal at Denny’s, but it was an herb before it was a garnish. It’s also loaded with anti-oxidants and is even purported to slow the growth of tumors. It’s worth noting that cucumber is not a traditional addition to Tabouleh, however I like the texture it adds. If you want to make a more traditional Tabouleh, just omit the cucumbers. Tabouleh tastes great the day it’s made, but I think it’s even the better the next day. Serve it as part of a Meze, or on a bed of greens as a salad. Whisk the lemon zest, lemon juice, olive oil, black pepper and salt together in a small bowl, then add the bulgur wheat. Let this soak for 1 to 2 hours, depending on the coarseness of your bulgur and how soft you want it. If the raw onion is too strong for your tastes, soak the minced onion in cold water for an hour or two to tame it. You may need to change the water a few times. Drain and dry thoroughly with paper towels before using them in the salad. Add the parsley to a large bowl along with the cucumbers, tomatoes and onions. Add the soaked bulgur along with the dressing and toss everything together. Tabouleh tastes fresh the day it's made, but if you let it sit overnight, the flavors have a chance to meld and it tastes even better. Looks like the perfect recipe to try next time the sun is shining! I’ve never made tablouleh, and so appreciate all of your great tips. The colors are so rich and beautiful. Once our tomatoes are fruit-bearing, I really want to make this. It’s a nice switch for a meatless light meal. I can do this! Finally! A tabouleh recipe that gives parsley its due! So many rely too heavily on the bulgar aspect. Been craving green myself, so this may just end up on our table sometime soon. In our area (southern California) the Lebanese cucumbers are called Persian cucumbers. They are so delicious! Tabouleh is great with mint, but I didn’t have any on hand the the day I made this. I’m surprised by the use of cucumber. I can’t recall that I’ve ever tasted tabbouleh with cucumber. This looks fresh and delicious. It exudes spring time! My family will be eating your Tabouleh this week. Bulgur salad is also really nice with a little pomegranate syrup. Yep, it’s not traditional, but I like the added texture the cucumber adds. Its is so good, green and tasty. Love to taste it now. Thanks for the recipe- irresistible salad! Only thing was my bulgur wheat seemed to need overnight soaking in the dressing to fully plumb up. Other than that- it was so simple and delicious! Thank you for posting this!! I once tried this salad at wholefoods and I have a ton of extra fresh parley right now but I could not, for the love of me remember what it was called! This is it! I am going to make it right now! Thank you!! Beautiful pictures by the way!! Tried it the other day but without the cucumber because didn’t have one. Still, turned out DELICIOUS! can i use couscous instead of bulgur? Use Quinoa instead of bulgar wheat and cilantro instead of parsley. Lots of lemon juice too!!!! Do you cook the quinoa first and then cool and use in the recipe? Hi Kathleen, if you’re going to use quinoa for this, you’ll want to cook it first. I used couscous and it worked out great! It is particularly delicious to use quinoa instead of bulgar. I’ve made this twice so far & it’s a favorite for bbq’s & picnic! Yummy! I would like to try this with quinoa and I was wondering if I can follow the same method or would you recommend I cook the quinoa? Thanks Rose! There seems to be a debate over whether eating quinoa raw is a good idea or not. Have a look on Google and decide for yourself whether it’s the right choice for you. I love taboule, and you are so right about the bulgur! also, here in Spain they always use Cous cous instead of bulgur, also the proportion is never good, being the vegetables a 20% of the ingredientes. I just found your web site, and I already love it! thank you for your work!!! Glad to hear you’re enjoying the site:-) I add mint sometimes too. Thanks for sharing the spices you add! I have always had Mint in my tabouleh, I am going to add brown rice, quinoa, and chia seeds for my grains and wheat grass and mint for my herbs, as I am always looking for Wheat substitutes and trying to come up with some thing I can use quinoa in. Hi Nelson, glad to hear you enjoyed it! Love the idea of having it for breakfast with poached eggs! I love your ideas you like mine, I love this world!! Thanks! I think your recipe is wonderful and looks gorgeous- I would definitely love to try it and think it’s wonderful that you’ve got your own take on ‘traditional’ dishes, which just about every family does in every part of the world.